Current access paradigms for the Web, i.e., direct access via search engines or database queries and navigational access via static taxonomies, have recently been criticized because they are too rigid or simplistic to effectively cope with a large number of practical search applications. A third paradigm, dynamic taxonomies and faceted search, focuses on user-centered conceptual exploration, which is far more frequent in search tasks than retrieval using exact specification, and has rapidly become pervasive in modern Web data retrieval, especially in critical applications such as product selection for e-commerce. It is a heavily interdisciplinary area, where data modeling, human factors, logic, inference, and efficient implementations must be dealt with holistically. 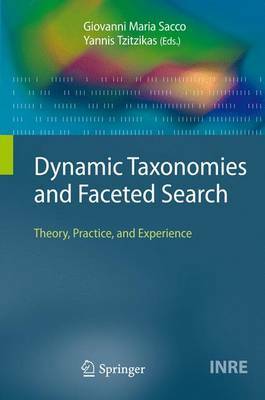 Sacco, Tzitzikas, and their contributors provide a coherent roadmap to dynamic taxonomies and faceted search. The individual chapters, written by experts in each relevant field and carefully integrated by the editors, detail aspects like modeling, schema design, system implementation, search performance, and user interaction. The basic concepts of each area are introduced, and advanced topics and recent research are highlighted. An additional chapter is completely devoted to current and emerging application areas, including e-commerce, multimedia, multidimensional file systems, and geographical information systems. The presentation targets advanced undergraduates, graduate students and researchers from different areas - from computer science to library and information science - as well as advanced practitioners. Given that research results are currently scattered among very different publications, this volume will allow researchers to get a coherent and comprehensive picture of the state of the art.